Can I get a woot! woot! This came in from Paul and Tracy over at at Branch. This weekend, they are having their first brick and mortar retail event. Branch carries beautifully designed sustainable products online, but for two days only, April 29th and 30th, they'll have a "flash store" event selling most of what they offer online as well as additional lines including Heath Ceramics and, believe it or not, sustainable bath towels constructed using beech wood fiber! There will also be some other surprises as well. Please spread the word about this event and if you're in the Bay Area, drop by between 1:00 p.m. - 8:00 p.m. on both days to say hello. Where: 1684 15th Street (between Valencia and Mission) in San Francisco, right around the corner from Jack Hanley Gallery. Here's a map. When: Saturday and Sunday, April 29 - 30. Hours are 1pm - 8pm both days. Other: Credit cards cheerfully accepted (Visa, MC, Amex, Discover). Questions? 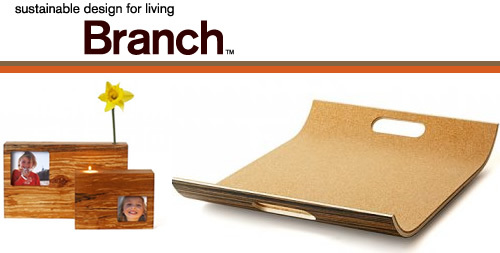 Feel free to contact them at info@branchhome.com or 415-341-1824. Design Within Reach - 50 New Items!